Per- and polyfluoroalkyl substances, collectively referred to by the abbreviation PFAS, continue to grab headlines as communities across the country worry about the safety of their drinking water. This family of more than 3,000 man-made compounds that made their way into manufacturing in the 1940s and 1950s are stable, mobile, persistent, bio-accumulative and seemingly ubiquitous. Public concern and the need to regulate PFAS has, in many respects, outpaced the study of PFAS, and regulators are grappling with determining the toxicity of individual PFAS compounds and establishing safe exposure levels. In 2009, the Federal Government established a short-term provisional health advisory for two PFAS compounds - PFOS and PFOA - of 200 ppt and 400 ppt respectively. In 2016, the Federal Government upped the ante by issuing a lifetime health advisory for these two PFAS compounds of 70 ppt, but these are just advisory standards. 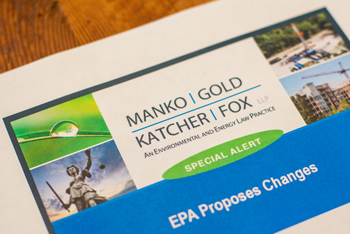 Meanwhile in 2018, EPA conducted “listening sessions” around the country and Congress held hearings on the topic of regulating PFAS. By most estimations, EPA is still years away from setting maximum contaminant levels for individual PFAS compounds, but increasingly, EPA is requiring responsible parties to sample for PFAS compounds during five-year reviews at Superfund sites. The States have been filling the void with a patchwork of inconsistent standards. As of last summer, 18 States had standards for one PFAS compound or another and New Jersey remained at the vanguard of State efforts to set limits on PFAS compounds in drinking water. In September of 2018, New Jersey established a maximum contaminant level (MCL) for one PFAS compound known as PFNA. Under the New Jersey Safe Drinking Water Act, PFNA now has an MCL of 13 ppt and public water systems in New Jersey will begin sampling for PFNA during the first quarter of 2019. In addition, the New Jersey Drinking Water Quality Institute (DWQI) has recommended health-based MCLs for PFOA of 14 ppt and PFOS of 13 ppt, far lower than the Federal advisory levels of 70 ppt. We can expect these New Jersey DWQI recommendations to become MCLs. In 2019, we can expect New Jersey to press forward with its aggressive health-based standards for other PFAS compounds in drinking water. Because New Jersey is at the forefront of the efforts to regulate and remediate PFAS, we will also likely see several technical issues play out in New Jersey as utilities grapple with sampling for PFAS compounds in the parts per-trillion and the best strategies for remediating PFAS contamination. Parties responsible for remediating contaminated sites will also be required to investigate and, if necessary, remediate PFAS to these very low levels. We can expect other States to follow New Jersey’s lead in the efforts to address PFAS contamination and limit exposure to PFAS.